Aims : This study evaluated the effect of 2% chlorhexidine cavity disinfectant on microleakage in class II cavities restored with light cured composites using a single bottle adhesive in an in vitro model. Materials and Methods : Proximal box cavities were prepared on mesial and distal surfaces of 40 non carious mandibular third molars, resulting in total of 80 cavities. Forty cavities on were rinsed with normal saline and 40 cavities were rinsed with 2% chlorhexidine cavity disinfectant. All cavities were restored with a single bottle adhesive and nano hybrid composite resin. Microleakage was evaluated at the gingival margin using methylene blue dye penetration method. Results and Conclusion : Chlorhexidine cavity disinfectants produced significantly higher microleakage while restoring the cavities using a self-etching single bottle adhesive. The purpose of this study was to evaluate the effect of 2% chlorhexidine cavity disinfectant (Consepsis Ultradent) on microleakage at the gingival margins in cavities restored with single bottle adhesive (Adper Easy One 3M ESPE). Forty freshly extracted caries free, human permanent mandibular 3 rd molars were used. Teeth were cleaned of debris and were stored in normal saline for a maximum period of one month. Proximal box-only cavities of standard dimensions were prepared on both proximal surfaces in all 40 samples resulting in 80 cavities. The occlusal portion of the preparation had a facio-lingual width of 1.5 mm. The gingival floor of the proximal box was kept 0.8-1.0 mm below the cemento enamel junction (CEJ) to keep the gingival margins in dentin. Each preparation was rinsed for 20 seconds with distilled water and dried with a blast of compressed air for 5 seconds. Caution was taken not to over dry the preparation. The samples were distributed into two experimental groups, each consisting of 40 cavities each. All the cavities were restored as given below. Group I: Adper Easy One (3M ESPE) was applied according to manufacturer's instructions with a saturated micro brush and rubbed for 15 seconds. A gentle stream of air was applied to create a shiny film and was followed by a 10 second polymerization. A clear plastic matrix strip was placed. A nanohybrid restorative resin (Z 350 3M ESPE) was placed in the cavity in 2 mm increments. Each increment was cured for 20 seconds by a QTH (Vivadent) light cure unit. Curing was done initially from the occlusal direction and then from the buccal and lingual directions. After curing, the matrix strip was removed and gingival margins contoured with Composite polishing kit (Shofu Co., Japan). Group II: A 2% chlorhexidine cavity disinfectant (Consepsis Ultradent) was applied with a sterile brush applicator. Consepsis solution consists of Chlorhexidine gluconate and ethyl alcohol with a pH of 6.0. The disinfectant stayed in contact with each tooth for 20 seconds followed by blast of compressed air for 5 seconds. Caution was taken not to over dry the preparation. After cavity disinfection, cavities were restored as in group I. All teeth were stored in distilled water at 37°C for 24 hrs. The teeth were covered with two coats of nail varnish to within approximately 1.0 mm of gingival margin, after the root apices were sealed with modeling wax. The specimens were immersed in methylene blue dye in separate sealable vials at 37°C for 24 hrs. After staining the teeth were rinsed off to remove residual dye. The radicular parts of the teeth were cut 6 mm below the CEJ. Coronal parts were sectioned mesiodistally in the approximate center of the restorations with a diamond disks (Horico H557F220) in a straight air motor handpiece. Microleakage was assessed for gingival margins at ×30 magnification by two examiners according to the following scale. A nonparametric analysis of variance was used to determine whether there were significant differences among groups. Since the values for microleakage were described as categorical variables, group wise comparisons were made using categorical two way tables using proportions. Since the data had categorical variables, the groups were compared using the proportions of samples with a particular score in each group. Two way tables of proportions were calculated and used for statistical evaluation using Kruskal-Wallis test [Table 1]. In 65% of cavities, which were restored without using chlorhexidine disinfectant, there was no microleakage, but number decreased to 35% after Chlorhexidine disinfectant application (P < 0.05). Moreover, chlorhexidine disinfectant application increased microleakage in all remaining 65% of samples [Figure 1]. Hence it was observed that Chlorhexidine disinfectant application increased microleakage in additional samples, where none existed and increased the microleakage in remaining samples. Chlorhexidine is a broad spectrum antiseptic, and its use has been generalized over the past two decades for chemical control of bacterial plaque; the disinfection of therapeutic cavities has been adopted as a positive control for studies on bacterial growth or antibacterial activity. Previous studies have demonstrated that chlorhexidine application prior to acid-etching in etch and rinse adhesives, has no adverse effects on immediate composite-adhesive bonds in dentin,  enamel,  or with resin-reinforced glass-ionomer cements. Recent studies have examined the use of chlorhexidine after acid-etching, demonstrating initial bond strengths comparable with those of the controls. ,,, Also, some in vitro as well as an in vivo study demonstrates preservation of hybrid layers with chlorhexidine treatment after acid-etching. Results of the present study have shown that use of 2% chlorhexidine disinfectant application increased microleakage in single bottle self etching adhesives. Self-etching adhesives have a pH relatively higher than phosphoric acid etchants. Scanning electron microscope examination by Meiers and Kresin  showed that cavity disinfectants applied to dentin surfaces were resistant to acidic conditioning. This acid-resistant layer might inhibit the ability of the weak acidic primers to effectively demineralize the dentin and hydrophilic resin to impregnate the dentinal surface. Chlorhexidine is water soluble and dissociates at physiologic pH. It inhibits bacteria adherence to surfaces by competing with calcium for retention sites. It also gets adsorbed by the smear layer and makes the dentinal surface acid resistant. 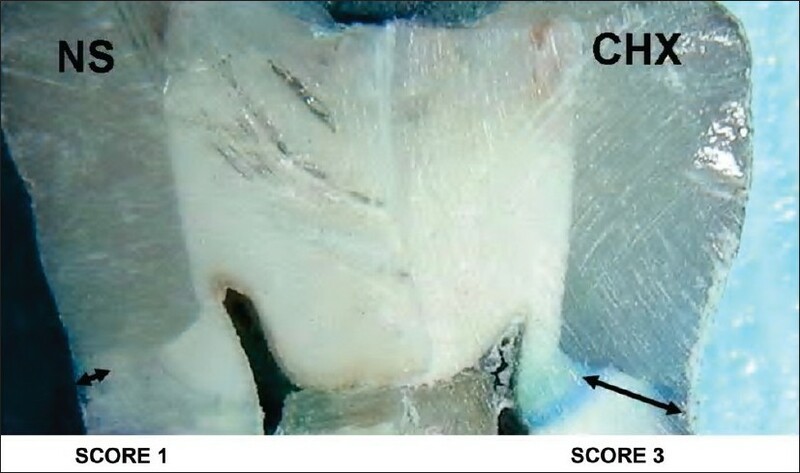 Our study indicates that the self etching primers might not effectively demineralize the acid-resitant dentinal tubules and subsequently incorporate the chlorhexidine adsorbed smear layer into them. It is well documented that use of chlorhexidine as a cavity disinfectant has a definite beneficial role in etch and rinse adhesives, but it might adversely affect the resin dentin interface in single bottle self etching adhesives. Further clinical studies need to be conducted to verify the results obtained by the present study. Within the limitations of this in vitro study, it can be concluded that use of 2% chlorhexidine cavity disinfectant increases the microleakage in cavities restored with light cured composites using a single bottle self-etching adhesives. 1. Asmussen E, Jorgensen KD. A microscopic investigation of the adaptation of some plastic filling materials to dental cavity walls. Acta Odontol Scand 1972;30:3-21. 2. Cheung GS. Reducing marginal leakage of posterior composite resin restorations: A review of clinical techniques. J Prosthet Dent 1990;63:286-8. 3. Retief DH. Do adhesives prevent microleakage? Int Dent J 1994;44:19- 26. 4. Lai JH, Johnson AE. Measuring polymerization shrinkage of photo activated restorative materials by a water-filled dilatometer. Dent Mater 1993;9:139-43. 5. Say EC, Koray F, Tarim B, Soyman M, Gulmez T. In vitro effect of cavity disinfectants on the bond strength of dentin bonding systems. Quintessence Int 2004;35:56-60. 6. Brannstrom M. The cause of postoperative sensitivity and its prevention. J Endod 1986;12:475-81. 7. Anderson MN, Charbeneau GT. A comparison of digital and optical criteria for detecting carious dentin. J Prosthet Dent 1985;53:643-6. 8. Meiers JC, Kresin JC. Cavity disinfectants and dentin bonding. Oper Dent 1996;21:153-9. 9. Crone FL. Deep dentinal caries from a microbiological point of view. Int Dent J 1968;18:481-8. 10. Leung RL, Loesche WJ, Charbeneau GT. Effect of dycal on bacteria in deep carious lesions. J Am Dent Assoc 1980;100:193-7. 11. Fure S, Emilson CG. Effect of chlorhexidine gel treatment supplemented with chlorhexidine varnish and resin on Mutans Streptococci and Actinomyces on root surfaces. Caries Res 1990;24:242-7. 12. Ersin NK, Aykut A, Candan U, Onçað O, Eronat C, Kose T. The effect of a chlorhexidine containing cavity disinfectant on the clinical performance of high viscosity glass-ionomer cement following ART: 24-month results. Am J Dent 2008;21:39-43. 13. Hebling J, Pashley DH, Tjaderane L, Tay FR. Chlorhexidine arrests subclinical degradation of dentin hybrid layers in vivo. J Dent Res 2005;84:741-6. 14. Gurgan S, Bolay S, Kiremitc A. Effect of disinfectant application methods on the bond strength of composite to dentin. J Oral Rehabil 1999;26:836-40. 15. Meiers JC, Shook LW. Effect of disinfectants on the bond strength of composite to dentin. Am J Dent 1996;9:11-4. 16. Bocangel JS, Kraul AO, Vargas AG, Demarco FF, Matson E. Influence of disinfectant solutions on the tensile bond strength of a fourth generation dentin bonding agent. Pesquisa Odontológica Brasileira 2000;14:107-11. 17. Perdigão J, Denehy GE, Swift EJ Jr. Effects of chlorhexidine on dentin surfaces and shear bond strengths. Am J Dent 1994;7:81-4. 18. Filler SJ, Lazarchik DA, Givan DA, Retief DH, Heaven TJ. Shear bond strengths of composite to chlorhexidine-treated enamel. Am J Dent 1994;7:85-8. 19. Cunningham MP, Meiers JC. The effect of dentin disinfectants on shear bond strength of resin-modified glass-ionomer materials. Quintessence Int 1997;28:545-51. 20. Soares CJ, Pereira CA, Pereira JC, Santana FR, do Prado CJ. Effect of chlorhexidine application on microtensile bond strength to dentin. Oper Dent 2008;33:183-8. 21. Brackett WW, Tay FR, Brackett MG, Dib A, Sword RJ, Pashley DH. The effect of chlorhexidine on dentin hybrid layers in vivo. Oper Dent 2007;32:107-11. 22. Korkmaz Y, Baseren M. Effect of antibacterial varnishes applied to root dentin on shear bond strength of tooth-colored restorative materials. Oper Dent 2008;33:65-71. 23. Chigira H, Yukitani W, Hasegawa T, Manabe A, Itoh K, Hayakawa T, et al. Self-etching dentin primers containing Phenyl-P. J Dent Res 1994;73:1088-95. 24. Watanabe I, Nakabayashi N, Pashley DH. Bonding to ground dentin by a phenyl- P self-etching primer. J Dent Res 1994;73:1212-20. 25. Tay FR, Pashley DH, Suh BI, Carvalho RM, Itthagarun A. Single-step adhesives are permeable membranes. J Dent 2002;30:371-82. 26. Dias WR, Pereira PN, Swift EJ Jr. Effect of bur type on microtensile bond strengths of self-etching systems to human dentin. J Adhes Dent 2004;6:195-203. 27. Barros JA, Myaki SI, Nor JE, Peters MC. Effect of bur type and conditioning on the surface and interface of dentine. J Oral Rehabil 2005;32:849-56.